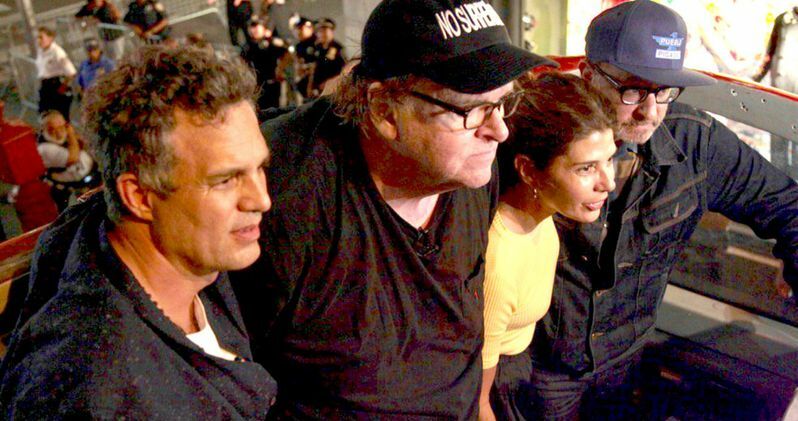 Director Michael Moore took to the streets last night with Olivia Wilde, Mark Ruffalo, Marisa Tomei, and many other celebrities as they teamed up with thousands of protestors outside of Trump Tower to protest the remarks made by Donald Trump on white supremacy yesterday. This movement goes beyond celebrities parodying Trump, which has been a growing trend. The President of the free world held a press conference and said that there were "good people on both sides," implying or rather, out right saying that some neo-Nazis and white supremacist's were good people. Mark Ruffalo was on hand in front of Trump Tower for the unwelcoming home coming for Donald Trump. The actor took to social media to share images and video from the protest along with Olivia Wilde and Marisa Tomei. Ruffalo's Instagram account posted a video of the actor talking about Nazis. Ruffalo said this. "There's two sides of this: people who fight Nazis, and Nazis, and that's it,"
Michael Moore was shown wearing a hat that read: NO SURRENDER while Ruffalo continued. He had this to say. "We want him to hear us. We want him to know that an American killed on American soil by a Nazi is not acceptable." The protest also doubled as a candlelight vigil for 32-year old Heather Heyer, the woman who was murdered over the weekend while protesting at a white supremacist rally in Charlottesville, Virginia. Trump's delayed and laid-back approach to responding to the situation in Charlottesville lead to Hollywood and the United States railing against Trump like never before. Former Republican Presidents George W. Bush and Bush Senior along with many of the Republican Party released statements condemning the acts of white supremacy and neo-Nazis, which Trump has yet to do in a meaningful way without calling mainstream news outlets fake news. Zoe Kazan showed up when the outrage kicked off the previous night, along with Anna Baryshnikov. Both returned on Tuesday, this time along with Marisa Tomei. Stealing the show, though, was definitely Olivia Wilde, who eventually met up to march with Moore and Ruffalo, carrying a giant sign emblazoned with the hashtag "#RESIST," which makes perfect sense for an actress who starred in an adaptation of George Orwell's dystopian 1984. Wilde started a chant: "Trump is not a legitimate President" while stating that, "we reject fascism" and "we reject white supremacy." As the night progressed, Ruffalo shared more of his thoughts with the crowd. He went on to say this. "He's allowed these people, he's allowed fascism, he's allowed the KKK, he's allowed Nazis to show their ugly face, and we're here to remind him there's a cost for that." Amazingly, Donald Trump did not recognize the protest outside of Trump Tower on his favorite form of talking: Twitter, but one has to imagine that he was probably not very happy about it as he ate his steak with ketchup and had his 2 scoops of ice cream after getting his second "good news" folder for the day. Much of the action took place after Michael Moore invited the audience of his Broadway play, The Terms of my Surrender, to the protest and even had charter busses provided for the "field-trip." It is pretty clear that the footage for the protest will be used in Moore's upcoming documentary on Trump entitled, Michael Moore in TrumpLand.